Left: A French paratrooper at the landing zone at Suez in 1956 is armed with a MAS 36.
be in reach of the firer's hand. The magazine was a five-round integral box and there was no safety catch. Small numbers of a modified MAS 36 were later made for airborne troops; they had shorter barrels and folding butts and were designated the MAS 36 CR39. Accepted as its standard rifle by the French Army in the late 1970s this distinctive weapon, with its large carrying handle, is nicknamed Clarion ("Bugle") by soldiers and has proved itself highly effective in general and special forces' service. A compact design, it fires from the closed-bolt position by means of delayed blow-back. Because of its bullpup configuration, the trigger mechanism and pistol grip have been mounted to the fixed, plastic, lower handguard. forward of the magazine well. The grip is ergonomically designed and has a storage trap containing a bottle of lubricant. The sheet metal trigger guard can be pulled away from the rear retaining pin and rotated for firing with gloves under adverse conditions. It has optional right-or left-side ejection and a three-round burst mode as well as single shot or fully automatic. It can be fired from either shoulder or bipod and has an effective range of 300m. Muzzle attachments permit the firing of anti-tank and anti-personnel grenades. There are versions with handle-integrated scopes and there is a shortened barrel version which is intended for use by special forces. 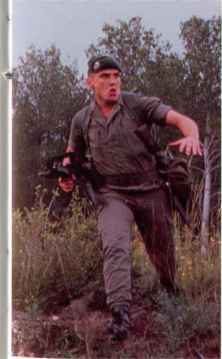 Left: A member of the elite Légion étrangère with his FA MAS on a training exercise. Intended as a specialist weapon for paratroopers, the FG 42 was one of the first assault rifles to see service, from 1942 onwards. The Germans were the first nation to adopt a bolt action rifle which they did as early as 1848 when their needle-gun officially came into service. Thereafter, unlike the British who went off at a tangent with hinged and falling block rifles, the Germans remained constant to this original system which they developed progressively. The first rifle to fire a smokeless round was introduced in 1888 and was of 7-92mm calibre: this was followed in 1898 by the model illustrated which was made by the well-known firm of Mauser. It was a strong and reliable arm with the forward locking lugs made famous by the makers, and a five-round magazine the bottom of which was flush with the stock, and although its straight bolt lever was clumsy and not well adapted to fast fire, this was a minor disadvantage which did nothing to detract from its popularity. In one form or another it was sold to a great number of different countries and there can have been few rifles produced in such large quantities. A considerable number of the earliest ones were bought by the Boers who used them with tremendous effect in their war with the British which broke out a year later, and it served the German Army well in World War I In 1918 the Germans experimented with a twenty-round magazine to prevent the constant entry of mud from the continuous reloading inseparable from the five-round magazine, but this was not a success chiefly because a spring powerful enough to lift such a column of cartridges made manual operation difficult. The Germans were among the pioneers of self-loading rifles and had a complete regiment armed with weapons of this type as early as 1901. This experiment was not followed up. principally because although valuable information was obtained the rifle then used was too heavy for an individual weapon. A few weapons of this type were used in World War I, but the main pre-occupation in 1914-18 was with a great volume of fire from somewhat heavier automatic weapons so again no progress was made. It was not therefore until the appearance of the Russian Tokarev self-loader just before World War II that any real attention was paid to the subject and by 1941 two separate models were undergoing tests. The first was the 41 (Mauser) which incorporated a bolt similar to that of the manually operated rifle: it was never a success and was soon abandoned. The second was the 41 (Walther) and this was a good deal more successful. It incorporated a muzzle cap which deflected part of the gases back onto an annular piston that worked a rod placed above the barrel, its return spring however being below it. This piston rod worked the bolt and the concept was reasonably satisfactory, although the arm had certain defects notably its weight and balance, together with a serious tendency to foul very badly round the muzzle cap It was manufactured in some quantity and issued chiefly to units on the Russian front. It was eventually replaced by the MP 43/44, a much superior weapon. 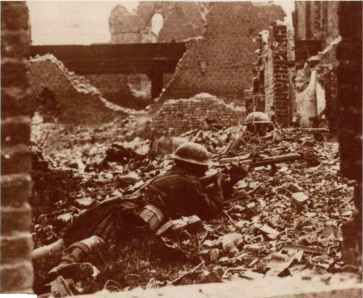 A German soldier armed with a 7 92mm Gewehr 98 rifle seeks cover during action. German soldier with Gewehr 41 rifle slung guards Polish PoWs taken in the fighting of 1939.
capable of single rounds or bursts. When bursts were employed the FG 42 fired from an open bolt, that is, there was no round in the chamber until the bolt drove one in and fired it in the same movement; the reason for this was that the chamber tended to get sufficiently hot to fire a cartridge left in it even for a very short time. It would take a bayonet and was equipped with a light bipod. Unfortunately it was expensive to make and being something of a specialist weapon for paratroops, its use declined during the war. 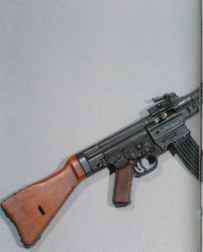 Closely resembling the Heckler & Koch Gewehr 3. from which it was developed, the HK 33 fired an intermediate round of 5-56mm. giving more accurate automatic fire than the 7 62mm cartridge of the G3. The experience of World War I led the Germans to the opinion that in the future the infantryman should have a lighter weapon than the standard rifle. Work on this project started before the war and by 1941 they had produced an efficient intermediate round suitable for a weapon of the kind proposed Perhaps surprisingly this round does not seem to have been considered for the FG 42, which was being developed at that time but which fired the standard rifle round. Instead a number of weapons were developed for it, and by 1942 these had been whittled down to two, one by Haenel. the other by Walther, both being described as machine carbines. The Haenel version was modified by Schmeisser in 1943 in the light of actual combat experience, after which it became the MP 43, the Walther alternative being dropped at the same time. The new weapon, which was gas operated through a piston working in a gas cylinder above the barrel, was an immediate success and by the end of 1943 the German Army had received fourteen thousand of them. The long-term idea seems to have been to make the MP 43 a universal weapon at squad or section level, so doing away with rifles, submachine guns and light machine guns in favour of the new arm. Perhaps fortunately, production declined very rapidly after the first few months of 1944 and so the new concept was never realized. There were some variations to the standard type, notably an MP 43 (1) which had a fixture allowing it to fire grenades, but no really significant changes. In 1944 the designation was changed to MP 44. apparently to mark the change in year since no other reason was ever offered, and by the end of the same year the weapon had been given the additional title of Sturm-Gewehr, or Assault Rifle. It is said that the expression was coined by Hitler himself; whether this is true or not it was a very apt description and one which has been used ever since. 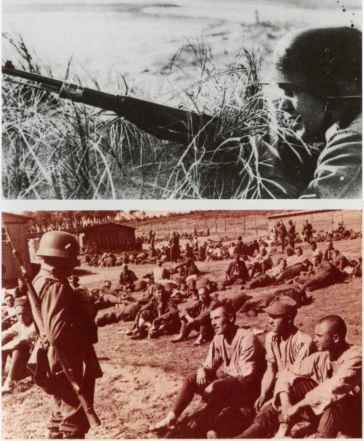 The MP 44 had a profound effect on the development of infantry firearms; the Russians in particular were quick to see the advantages of this new type of arm. and very soon developed their own version in the shape of the AK 47.
held closed until the pressure dropped to a safe level when the rollers were forced out of the recesses. The residual gas pressure in the chamber blew the empty case backwards, taking the bolt with it and compressing the return spring which caused the cycle to be repeated. This method proved to be successful although the use of a full-sized rifle cartridge does often cause problems in a breech of this nature. The main difficulty is that the bolt comes back fairly fast, with no preliminary turning motion to start the case, and this can cause problems of extraction; this was basically the problem of the American Pedersen rifle which is dealt with elsewhere in this section. In the G3 the problem was dealt with by fluting the chamber and by ensuring that the quality of brass used in the case was sufficient to withstand the initial jerk without having its base torn off. The HK 33 was simply a logical development of this earlier weapon, to which it bears a strong resemblance both externally and mechanically. The chief, and important difference is that the HK 33 was designed to fire an intermediate round which offered some advantages. It gave good performance at reasonable ranges and allowed for much more accurate automatic fire than was ever the case with the more powerful 7-62mm cartridge. 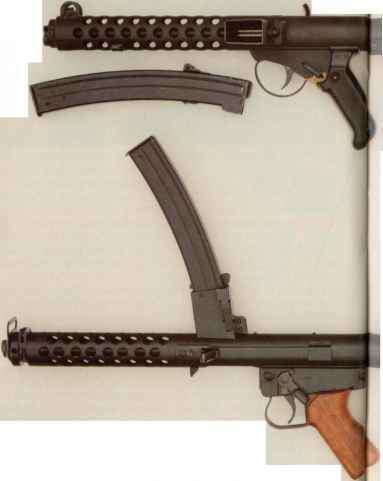 The HK 33 is no longer made but there are several derivations from it, including some with telescopic butts, a sniper model, and a shortened version. Men of the 1st Cameron Highlanders, armed with Short Magazine Lee-Enfield rifles [apparently Mark Ills] at Cuinchy, April 1918. British experience in the South African war of 1899-1902 showed the need for a short rifle for universal use and even before the end of the war a new weapon had been produced and a thousand made for trials. It was also tested operationally in the fighting against the Mad Mullah in Somaliland. and after some modification emerged as the Short Magazine Lee-Enfield Mark II in 1907. It was an excellent weapon and although slightly less accurate than its predecessor it had certain compensating advantages, notably its easy breech mechanism which allowed a fast rate of manipulation. The British Army had concentrated on rapid rifle fire to the stage where every soldier could fire at least fifteen well-aimed shots in a minute, and the devastating effects of this were clearly seen extra barrel band near the muzzle its main difference was that it had an aperture backsight rather than the open U-type of the earlier rifles, experience having shown that this type of sight was easier to teach, while the increased distance between backsight and foresight reduced the margin of error and made for more accurate shooting. In the end. however, it was decided that the conversion of the large existing stocks of rifles would be too expensive and although the development of a new rifle was maintained the British Army continued to rely on its well-tried Lee-Enfield until well after the outbreak of war in 1939. No separate data is given for the Mark V because apart from the fact that it was only sighted to 1400 yards it differed little from its predecessor. Although the Lee-Enfield series of rifle had proved remarkably successful there was still some residual prejudice against its bolt in favour of the forward locking Mauser sytem, and this seems to have been the main reason for the development of this new rifle. Work started on it in 1910 and by 1912 it was in limited production for troop trials which began the next year, hence the designation of the arm. Although of unmis-takeable Enfield parentage it differed from the earlier range in that it had a Mauser-type bolt and fired a rimless cartridge from an integral five-round magazine. It also had an aperture backsight protected by a somewhat bulky extension on the body above the bolt way. It is perhaps not unfair to describe the Pattern 1913 as a near disaster, for although it was very accurate there was little else to say for it. 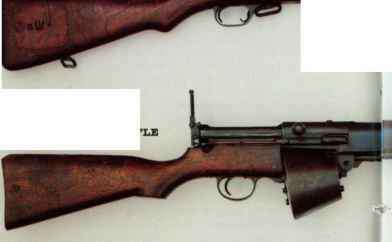 It was slow and clumsy to manipulate, particularly for men accustomed to the Lee-Enfield; it was subject to excessive metallic fouling in the bore; it had a tremendous flash and a correspondingly loud report; worst of all, the breech heated so fast that after fifteen rounds or so there was a distinct risk of the round firing as it went into the chamber, which was not conducive to good morale. Although extensive modifications were at once put in hand the project was finally shelved as far as the British Army was concerned by the outbreak of World War I which in view of the major role played by the British rifle in 1914 was probably just as well. Soon after the war started the rifle was converted to fire the standard British service round, but as there were no suitable facilities for making it in the United Kingdom arrangements were made to have it manufactured in the United States by the Winchester, Eddystone, and Remington factories. This new rifle was then designated the Pattern 1914 and in view of its accuracy it was eventually used as a sniping rifle with the addition of a telescope sight. Apart from its different calibre its main external difference from its predecessor was in the absence of the inclined finger slots cut in the stock at the point of balance. The Pattern 1914 was also modified for use by the United States Army, by whom it was designated the Enfield 1917; large numbers of these were bought by Great Britain in 1940, mainly for the use of her Home Guard and the fact that they were of -30" calibre led to some confusion.